Bring home this comfortable, cozy and cuddly Mickey Mouse with the Disney Mickey Mouse Clubhouse High Back Chair from Marshmallow! Designed for children 1.5 and up, the High Back Chair offers a comfortable place to play, watch a favorite TV show or read. Its high-density foam construction makes the chair lightweight, stable and cozy. As an added convenience, the slipcover is designed with a safety zipper to protect your little one. To unlock, insert a paperclip into opening, pull upwards and slide to unzip. The High Back Chair is also machine washable using mild soap and water. Bring your child’s favorite characters to life with the fun and comfortable line of Marshmallow High Back Chairs! 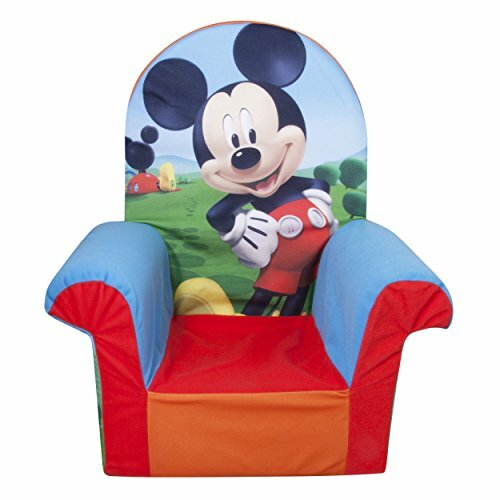 Now toddlers can take a seat in the 'Just My Size" Disney Mickey Mouse Clubhouse themed High Back Chair! Marshmallow High Back Chairs are for Toddlers 18+ months. Size: 20.8"H X 14.5"W X 12.8"D. Made from 100% Polyester and 100% P U foam.